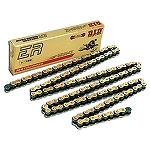 - Our DID Motorcycle Chains generally ship out within 1 business day! - DID Standard Roller Chains are a non O-ring chain with long life and durability at a reasonable price. 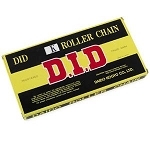 - DID chains have been around for years and have proven themselves as one of the leading brands in the industry. - 1 Clip link is included with each chain purchase. Not sure which chain & sprockets your bike needs? Check out our application guides above to find out what the OEM chain & sprocket sizes are for your bike. We have a list of almost every motorcycle ever made and the OEM sizes it came with. You can adjust your sprocket sizes slightly to gain power in certain areas. For example... The larger your rear sprocket is, the lower it is geared. On the front sprocket it works opposite. The larger your front sprocket is, the higher your bike will be geared. For the lowest gearing you would want the smallest front sprocket with the largest rear sprocket. For highway riding and higher speeds you would want the largest front sprocket with the smallest rear sprocket. Most bikes come stock with a happy medium gear setup for all purpose riding.